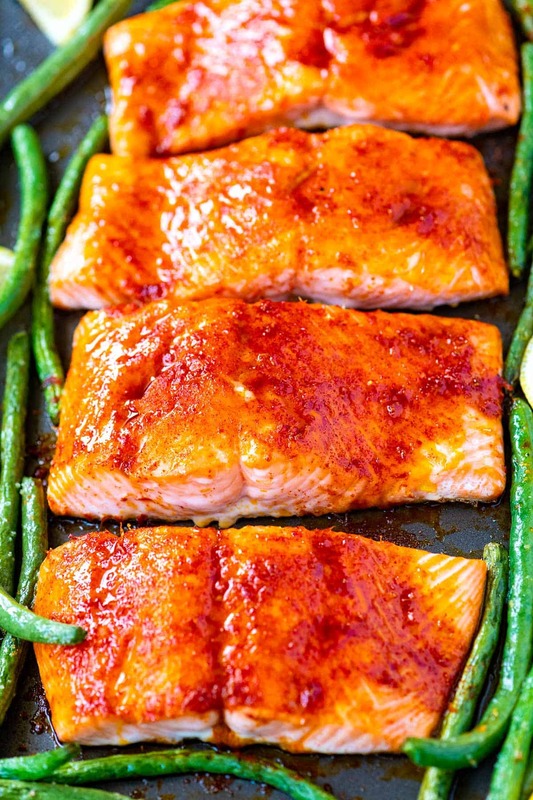 This brown sugar baked salmon is such an easy dinner. 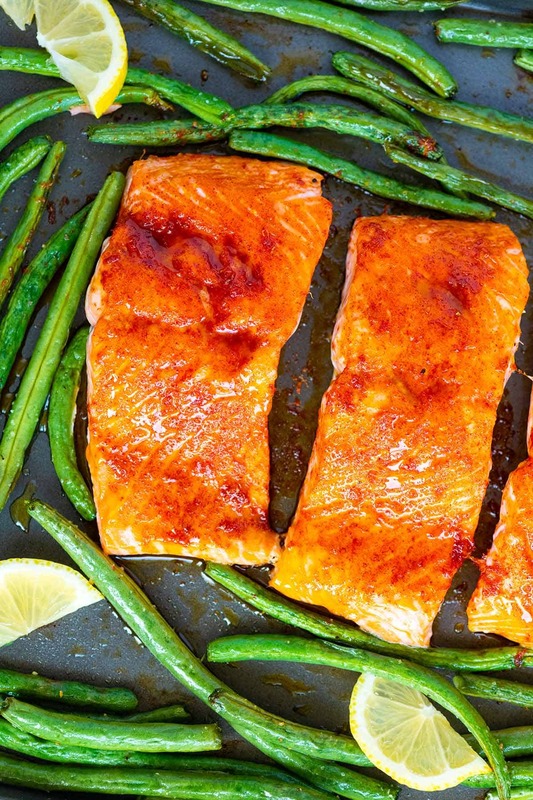 By roasting the salmon on a large sheet pan, you can add green beans (or your favorite vegetables) for a one-pan, no-fuss meal. 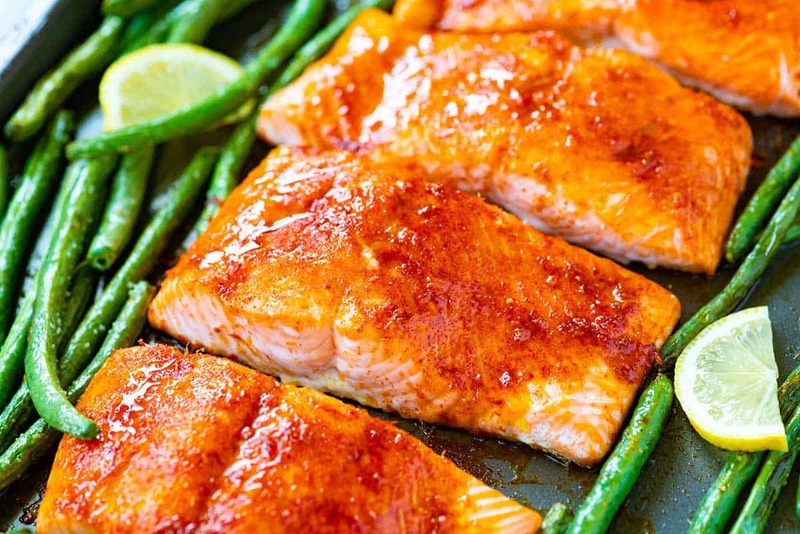 Jump to the Brown Sugar Baked Salmon Recipe or read on to see our tips for making it. What I love about this recipe is that everything needed for a delicious meal happens on one pan. 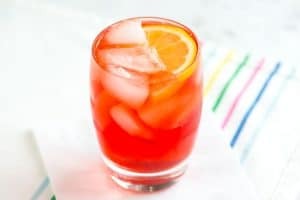 Hello, easy cleanup! We love roasted green beans and salmon together, but you can substitute most veggies in their place (see below for some suggestions). Oven-baked salmon turns tender, moist, and soft in the middle. Add our brown sugar spice rub, and the outside becomes lightly caramelized and ultra-flavorful. The green beans taste amazing, too. We season them with salt and pepper, but since they are on the same pan as the salmon, they mingle with the juices and fat released by the fish. Delicious! Brown sugar adds sweetness, and it lightly caramelizes in the oven. You don’t need lots of it, though. 1 tablespoon for four large fillets is plenty. Salt seasons the salmon and makes it taste amazing. Lemon zest adds a pop of flavor. We use our microplane to zest the lemon. You can then cut the zested lemon into wedges and serve it with the baked salmon. A squeeze of fresh lemon juice just before serving is a must. Smoked paprika adds a smokey-sweet flavor to the rub. It also adds color. For a spicier rub, try chipotle powder instead. We’ve already protested our love of baking salmon and have shared a few variations. This butter baked salmon is mouthwatering, and our classic lemon and dill baked salmon never fails. We love both of those recipes, but we’ve never shared a salmon recipe as easy as this one. 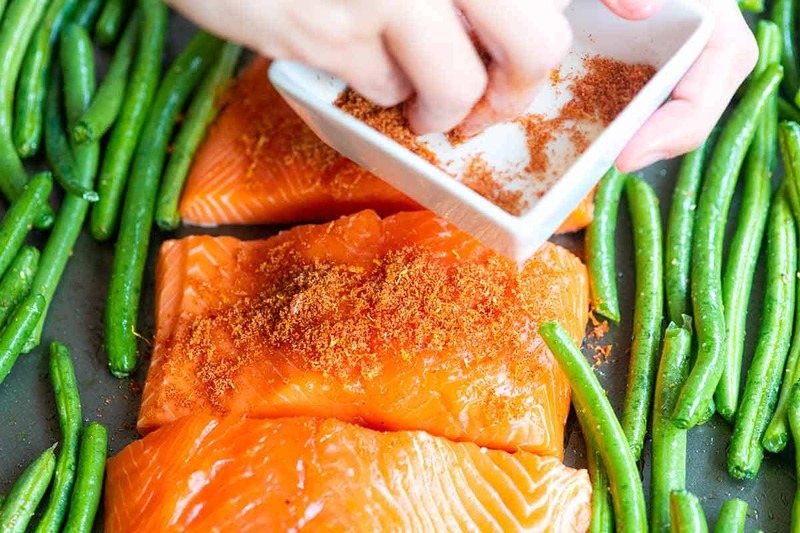 Step one, rub our simple spice blend onto salmon fillets. Step two, add the salmon and veggies tossed with olive oil, salt, and pepper to a sheet pan. Step three, bake until the salmon is cooked through. Step four, serve with lemon wedges and enjoy! I know you don’t want to read this, but the time it takes to cook salmon depends on a few things. First, what type of salmon do you have? Atlantic or King salmon are often thicker and fattier than Pacific Sockeye or Coho. The thickness will change the cook time quite a bit. In our recipe, we use a 400-degree Fahrenheit oven, which is a higher temperature compared to the other salmon recipes on the blog. (We usually go for 325F). The higher temperature quickens the cooking time and helps to add some color to the veggies on the pan. A 1-inch thick, middle cut fillet of salmon takes 10 to 15 minutes. For thinner or end pieces, check the salmon a bit earlier. For thicker fillets, you may need an additional 5 to 10 minutes of bake time. Your best bet for checking if salmon is cooked is a thermometer — we cook salmon to 125 degrees F, which means it will be soft, tender, and slightly pink in the center. The texture at this temperature is much better than when cooked to a higher temperature. For a visual cue, look for the flesh to be somewhat opaque. Also, when inserting a knife into the salmon, it should slide through easily. Note that the USDA recommends cooking salmon to 145 degrees F. Interestingly enough, Cooks Illustrated suggests that the ideal internal temperature of salmon (especially wild varieties) is 120 degrees F. Everyone has an opinion on this one, but for now, we are sticking to 125 degrees F.
As for the vegetables, we love green beans, but you can substitute for other veggies. One thing to keep in mind is that heartier vegetables like potatoes and winter squash will take longer to bake than the salmon. To deal with this, add them to the baking sheet and bake until almost tender. Then add the salmon fillets and cook until done. Broccoli, cauliflower, and Brussels sprouts take 20 to 25 minutes. 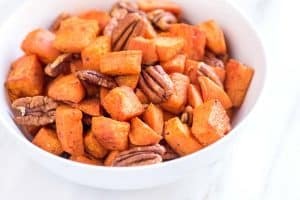 Root vegetables like potatoes, carrots, and beets take 30 to 45 minutes. Winter squash (like butternut or acorn) cut into cubes takes 40 to 45 minutes. For a different spin, try our Easy Sour Cream Baked Salmon. We slather a mixture of mustard, sour cream, and parmesan on top of salmon fillets and bake until done. Our Grilled Salmon is easy and is served on a bed of couscous and topped with grilled nectarines and crumbled goat cheese. Great for summer! Another favorite way to cook salmon is by grilling on a cedar plank. Try our Sweet Citrus Rubbed Cedar Plank Salmon. The spice rub is the same! Adam loves these Pan-Seared Salmon Burgers. Thanks to a little agave, they brown nicely in the pan and taste amazing. This brown sugar baked salmon is such an easy dinner. 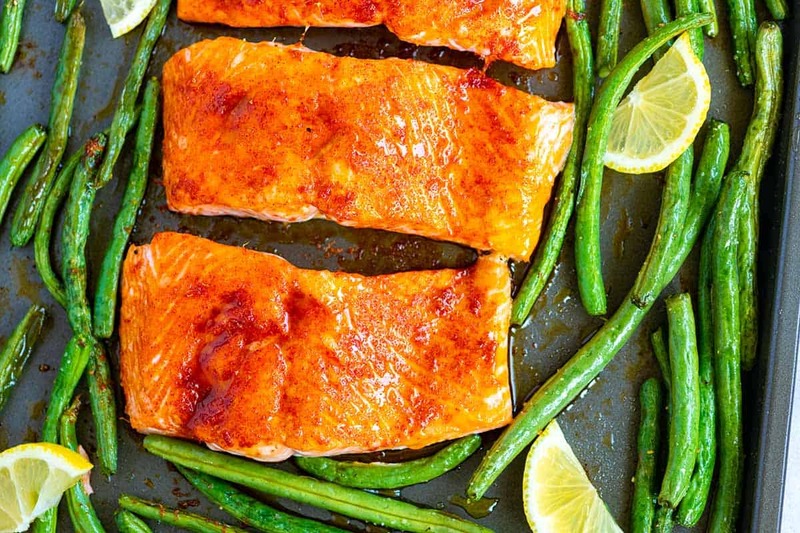 By roasting the salmon on a large sheet pan, you can add green beans (or your favorite vegetables) for a one-pan, no-fuss meal. In a small bowl, mix the brown sugar, lemon zest, 1/4 teaspoon of salt, and the smoked paprika. Pat the salmon dry and rub with the olive oil. 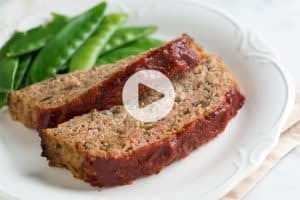 Add the green beans to a large, rimmed sheet pan (or baking sheet). Drizzle the olive oil over the beans and season with about 1/4 teaspoon of salt and a generous amount of fresh ground black pepper. Toss the green beans around the pan. Push them to the outer edges of the pan, leaving space in the middle for the salmon fillets. Add the spice rubbed salmon fillets, skin-side down, to the sheet pan. Bake the salmon until it is cooked through and green beans are crisp-tender, 10 to 15 minutes depending on the thickness of the fish. We cook salmon until an instant-read thermometer reads 125 degrees Fahrenheit when inserted into the thickest part. Serve with lemon wedges on the side for squeezing over the salmon. How to tell when salmon is cooked: Your best bet for checking if salmon is cooked, is a thermometer — we cook salmon to 125 degrees F, which means it will be soft, tender and slightly pink in the center. For a visual cue, look for the flesh to be somewhat opaque. Also, when inserting a knife into the salmon, it should slide through easily. Cook time: Depending on the type and thickness of the salmon you are baking, cook time will vary. The cook times suggested above are for middle cut fillets, about 1-inch thick. For thinner fillets or end pieces, check the salmon a bit earlier. For thicker fillets, you may need an additional 5 to 10 minutes of bake time. Another gem from your website 😊 This was easy to make and it packs a lot of flavor. 🙂 I didnt have lemons on hand so i substituted with an orange. It turned out great – for some reason, it reminded me of salmon teriyaki. Thanks again. This will be definitely on my rotation of salmon dishes! My husband doesn’t eat fish but he loved the flavors of the salmon. Me too! Love your site. Awesome! Made with frozen, wild caught salmon filets from Kroger. Followed the recipe exactly, except I used ¼ tsp. smoked paprika and ¼ tsp. chipotle powder, instead of ½ tsp. of one or the other. Chipotle complemented paprika amazingly, just the right amount of heat and smokiness. Served with roasted baby portobello mushrooms tossed in olive oil, salt and pepper, coarsely chopped fresh rosemary from our garden, and coarsely chopped fresh garlic. Also served roasted cauliflower/carrot blend tossed in Harissa spice. All was cooked on sheet pans, at 400 degrees. Started veggies cooking first, then put the salmon in when veggies had about 15 minutes lift to cook. Everything went well together, like it was meant to be… My 7-year old son said, “It’s F’ing awesome!”… we try to not cuss much, but alas! we’re human. Anyway, will definitely make this again. Thanks for a tasty, easy meal! I made this! It was amazing! Perhaps my favorite at-home salmon to date. Thanks so much for this and your other awesome content. 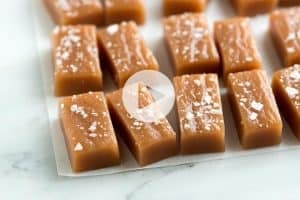 I really love that you use traditionally “unhealthy” foods (sugar, for example, in this recipe) but limit it to a very small amount. I do the same with sugar and heavy cream in various recipes and sauces which really amps the flavor without a huge amount of calories. Too many people shy away from these ingredients when it’s really the balance of it all that contributes to amazing food. Thanks again! I always bake on non-stick foil for easy clean up.